For many decades the house of the Lord has been neglected. This statement may seem embellished to those who lived in the explosion of fundamentalism or even evangelicalism. This is why many think we are crazy to embark upon this church planting mission since there is a church on every corner. However, all is not as it seems in American Christendom. First, there has been a huge decline in Christianity. Our fundamentalist and evangelical fathers forsook the creedal and covenantal religion of their fathers and now their children are forsaking the faith altogether. Dickerson went on to cite a Pew Research Poll that revealed only 7% of Americans are evangelicals even though 25% attend evangelical denominations.2 Increasingly, American Christians within evangelical denominations do not hold to traditional Christian beliefs. The influence of the Church Growth Movement and the Emergent Church Movement has dramatically eroded any remaining orthodoxy of the American Church. The big concern is the younger generations. They are fleeing from the Church in droves. This is not confined to evangelicals but is across the board among all the “Christian” denominations. “One common thread in every survey has been the significant number of Millennials among these ‘Nones.’ The initial Pew survey found that nearly one-in-three members of the Millennial generation (32%) has no religious affiliation. But, who are these faithless twentysomethings? Where did they come from? Did they ever claim faith? And what is it about religion that has left them cold? “Recent surveys by the Barna Group have shed light on this trend by examining those 18- to 29-year-olds who used to identify themselves closely with faith and the church, but who have since begun to wrestle with that identity. In fact, between high school and turning 30, 43% of these once-active Millennials drop out of regular church attendance—that amounts to eight million twentysomethings who have, for various reasons, given up on church or Christianity. First it shows the failure of the lowest common denominator approach of the 20th Century. Beginning with Fundamentalism and Evangelicalism, we are seeing the bad fruit of Christian reductionism. The abandonment of our creeds, confessions and the deep theology of the Reformation did not produce the results promised. We were promised massive converts and for a while evangelicals believed the results lived up to the sales pitch with the yearly millions of conversions from the early 20th Century through the 1980’s. However, the long run has proven that easy believism is not true conversion. Reducing the Gospel to emotional decisions is not expanding the Church but destroying it. Second, it shows the need to return to the historical Christian faith. It was foolish to think we could improve upon the past. Too many have viewed the Christian faith like liberals. It is time for Christians to reject the liberal living (evolving) faith heresy and return to the original intent view. What we really had in the 20th Century was a reinvention of the faith. It was not the faith of our Reformation fathers but a new religion designed for a materialistic and now secular people. This is why we here at Reformed Holy Trinity are proclaiming the need to rebuild the house of the Lord. The true Church has been abandoned and became desolate over the last 100 years. It is in a state of disrepair just like the temple in post-captivity Jerusalem. Haggai was one of the three prophets who prophesied after the captivity. In the book of Scripture that bears his name, he rebukes the Jews who had returned to Jerusalem and neglected to rebuild the temple. Even after God restored them to their homeland, they were still neglectful in their duty to God. They had concern for their personal enterprises but were apathetic to God’s house. In the midst of our destruction we are witnessing the same indifference even among traditional and Reformed Christians. It was the very forsaking of the true religion of Jehovah that caused Israel and Judah to be destroyed. In God’s mercy he allowed a remnant of Jews to return to Jerusalem to rebuild that which had been lost. Yet, they were blindly and carelessly repeating the mistakes of the past. Our destruction is also the result of God’s house being abandoned. Yet, in the midst of our desolation we are still refusing to return unto the Lord. The cause and effect is easily identifiable but our negligence to remedy our failures only proves the willful blindness of hard hearts. It is no wonder that Nehemiah reacted with such anger against the apathy of his countrymen. What we need is for more Nehemiah’s, Ezra’s and Haggai’s today. 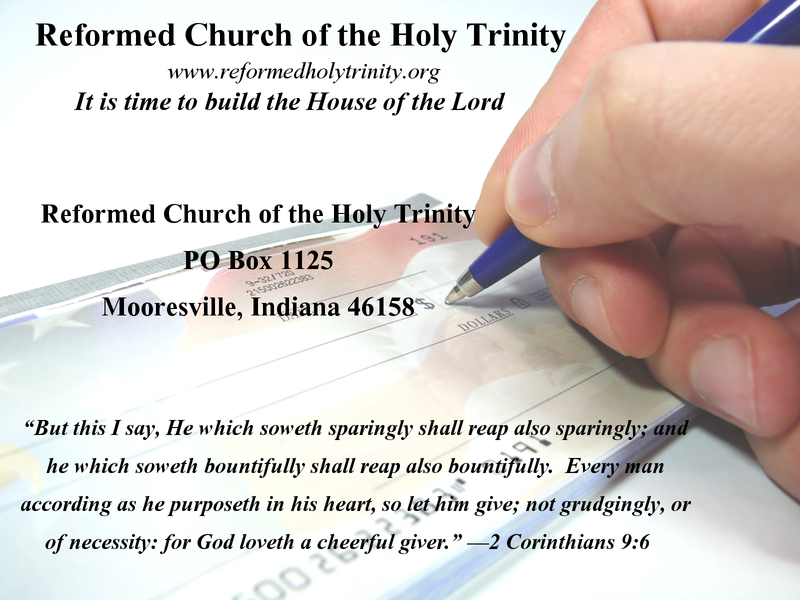 Reformed Church of the Holy Trinity has issued the call to rebuild the house of the Lord in south-central Indiana. We are looking for motivated men and women with vision to join with us in this effort. The Lord will be with us if we will just commit to reestablish Christ’s Holy Church in our land. If we want true reformation of the family and our society, it must first begin with the building of God’s house. If we are going to build, it must be upon the proper foundation, which Paul shows us in Ephesians 2:20-22. Unless our foundation is the Word of God we are wasting our time. We must be done with reductionism, emergent ideals and the desire for worldly approval. While it is easy to express our desire for the house of the Lord to be rebuilt, it is another to actually do it. What we need is the commitment of those who affirm the ancient faith. Unless we are steadfast in pledging our lives, our fortunes and our sacred honor we will not be fruitful in our mission. It is going to take more than verbal affirmations and empathy. 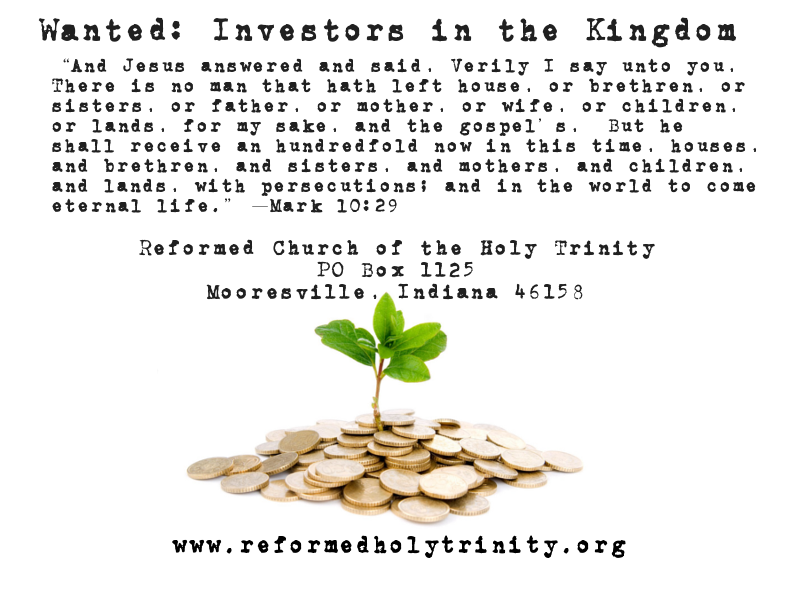 If you live in the south-central region of Indiana we invite you to join with us in rebuilding the house of the Lord. Reformed Church of the Holy Trinity is not a glamorous, luxurious or alluring work but a call to a lifetime of service, sacrifice and steadfastness. This church will not spring up in a day but with dedicated people, both locally and beyond, we can build a foundation that will impact generations to come. If you live outside of our region you can still be instrumental in starting this church and expanding our ministries. The two biggest ways you can assist us is in prayer and financial support. We earnestly covet your prayers for “except the Lord build the house, they labour in vain that build it” (Psalm 127:1). Only by God’s grace can we expect success in this kingdom building venture. We also need faith partners who desire to invest in the kingdom. What better way to make a difference in our society than by helping plant an embassy of Heaven. Please consider sponsoring this church plant and help make a difference that will count for eternity. This is the hour to rebuild the Church of Jesus Christ in America. Attempting to patch the Titanic is a fool’s errand. The iceberg of apostasy has punctured the bow of evangelicalism because it is of inferior design. While we must attempt to rescue those who are perishing onboard, the fact is the apostate ship must be abandoned. It is imperative that we launch the lifeboats to take as many as possible to the old ship of Zion. While the evangelical titanic promised it could not be sunk, only the true Church of Jesus Christ has the promise of victory over the gates of hell. We submit this is the reason for our continual regression in society. 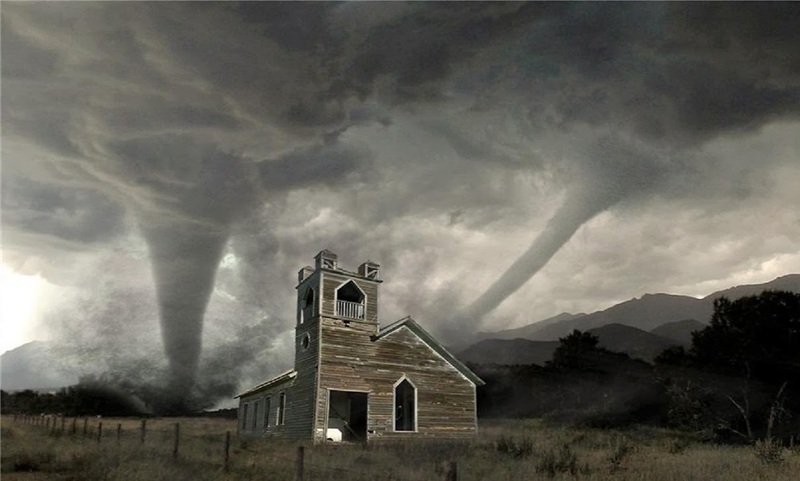 Until the Church is restored, do not expect things to get any better. What many conservatives fail to see is that only the Church can reclaim America. Christ’s Church is the “pillar and ground of the truth” (1 Timothy 3:15). This Church is the body of Christ and outside of Christ there is no hope. It is Christ who has been given all power and authority in heaven and on earth (Matthew 28:18). In our next post we will discuss how we must rebuild the Church in our society. However, if we are not totally committed to this rebuilding project, all the knowledge in the world is vain. We do not need theoreticians but laborers in the field. Brothers and sisters, the time is now to “seek ye first the kingdom of God, and his righteousness; and all these things shall be added unto you” (Matthew 6:33). The choice is ours. We can reclaim our land or we can mourn in the day of destruction because we did not commit to the things Christ commissioned for His saints. The battle is not going to be won through para-church organizations, political action committees or charitable organizations. While these things may be well and good in their proper context, the Church is the pillar and ground of the truth. Let us do all we can to build and advance Christ’s Church.